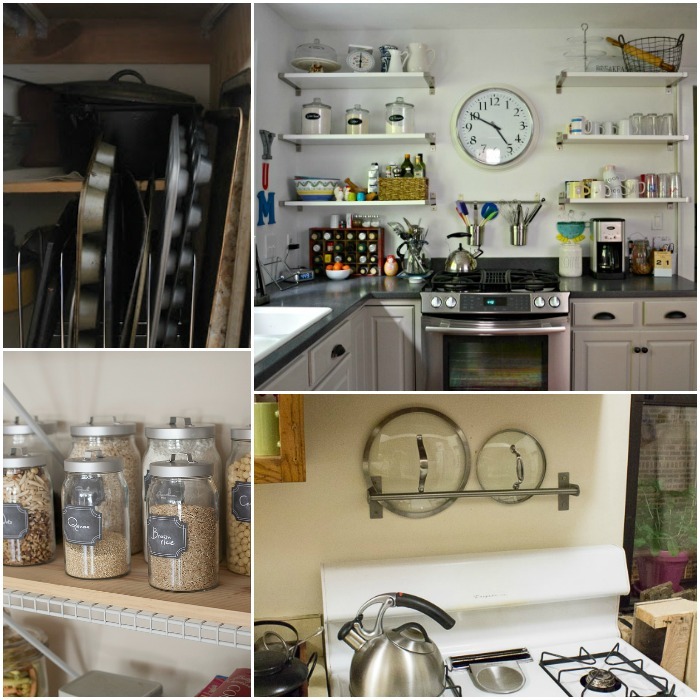 Our previous post on organizing the kitchen was a big hit, and well, you can never have too many organization tips, right? We’ve found 15 more tips and tricks for you, and the good news is, these are super easy ideas that you can implement without a lot of fuss. Ready? 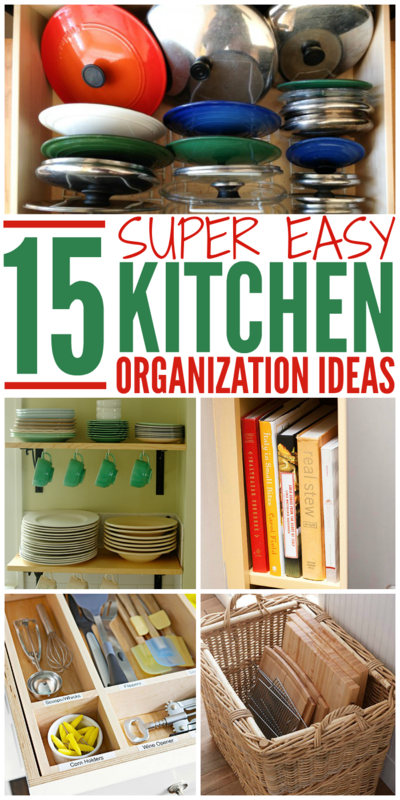 Let’s organize that kitchen! If you need to clean your kitchen before diving into organizing, try a few of these kitchen cleaning hacks. They’ll make your life so much easier! Hang cups and mugs on hooks under shelves and cabinets to save cabinet space. 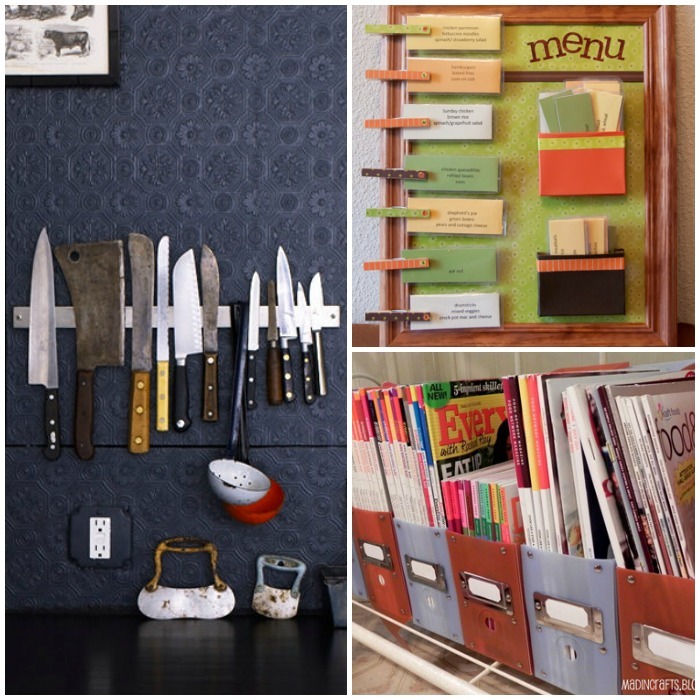 Carve out a little nook in the wall to store your cookbooks to keep them off your counters. Use a tall basket to store your cutting boards and cooling racks instead of cramming them into your cabinets. Label your drawer dividers so you always remember where everything goes. It’s a great way to get the kids on board with keeping things organized, too. Use a wire organizer or CD rack to keep pot lids tidy. Have a big collection of cooking magazines? Keep them organized in magazine holders. Instead of buying them, save a few bucks by making them yourself out of cereal boxes. If you’re trying to figure out a great meal planning system, this is it. Their favorite meals are on the front, the ingredients on the back. It makes shopping and cooking so much easier! A magnetic strip is a cool way to store your knives. Not recommended in a house with young children, though! Scrapbook organizers also work well for storing cutting boards. Hang your kitchen towels on pretty handles. You can choose hardware to suit any decor… It adds a nice touch. 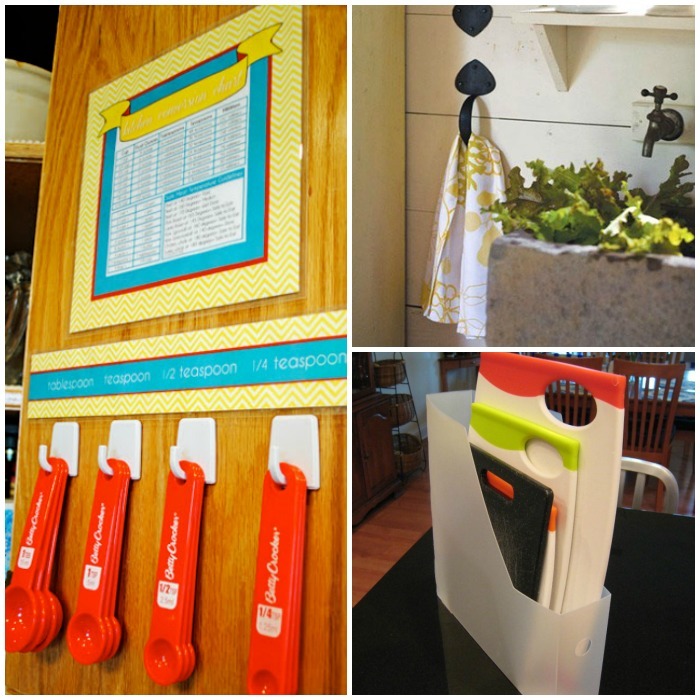 Hang your measuring spoons and cups on the inside of the cabinet door with command hooks. Add a towel bar above the stove to hold lids when you lift them to stir a pot. Genius! Using kitchen zones can really help you keep things neat. Do you have all of your baking tools and small appliances together? Is everything you need to make coffee right by the coffee maker? If not, make it happen. Store cookie sheets and muffin pans upright in a pot rack. If you don’t have a lot of cabinet storage, open storage can look neat and tidy when you use matching containers and labels.